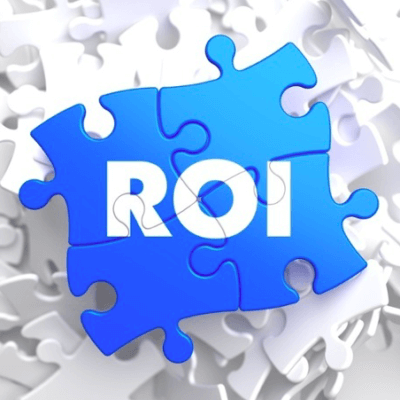 You may be wondering how to calculate your sales and marketing ROI. If you are not a sales manager or unfamiliar in setting sales targets this might be of value to you, especially if you are used to marketing metrics and ROI only. For a fully aligned sales and marketing approach, you need to ensure that the ROI and metrics you are using make sense. The accountability of marketing to sales AND sales to marketing needs to be agreed upon as a vital component of the overall strategy. We believe the only real way to ensure the sales and marketing ROI is tangible is to measure common metrics. To start the process, reverse engineer your sales objectives and flip your full funnel upside down from your desired sales (bottom of funnel) first right through to marketing (top of funnel) to determine the required marketing budget and lead activity required to help achieve your sales target. 1. What is your sales target? What is your annual revenue target for the financial year? This can be broken down into annual, quarterly or monthly measurement for tracking. 2. 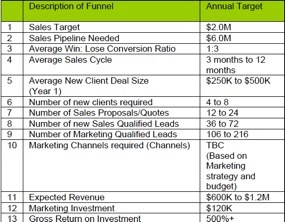 What is your required sales pipeline? Depending on the product and services you are selling, from historic performance and average trends, how many qualified deals do you need in your pipeline at any one time to reach your sales goals? A typical rule of thumb is 3x to 5x times pipeline value in order to reach your sales quota. 3. What is your average sales cycle? How long does an average sale take to close? 4. What is your average deal size? What is the average dollar value of your typical sale for your product or services? 5. How many proposals and quotes do you need to deliver? Simply divide your sales revenue by the average deal size to get an estimate of how many quotes/proposals you need to send out. 6. How many Sales Qualified Leads (SQL) do you need? Typically we work off a 3x times ratio for SQLs to quotes/proposals issued after sales engagement. 7. How many Marketing Qualified Leads (MQL) do you need? The definition of a MQL is based on what marketing generates from a cold lead prospect. Typically we work off a 3x times ratio for MQLs needed to generate enough SQLs – i.e. one in every three MQLs will progress to be accepted as a SQL. 8. How many lead prospects do you need? In order to generate sufficient MQLs, we work off an average of 3x times leads and prospects to create and qualify MQLs through the nurturing and generation process during initial qualification. This is normally generated from digital marketing metrics or event attendance metrics like web visitors, CPC, Google Adwords or forms submitted. 9. 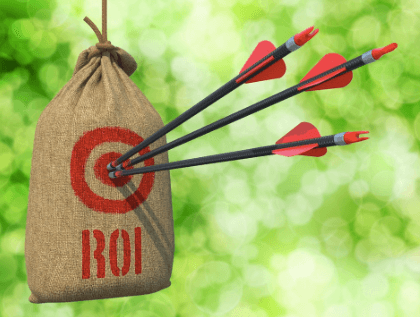 What is the cost of your marketing campaign needed? 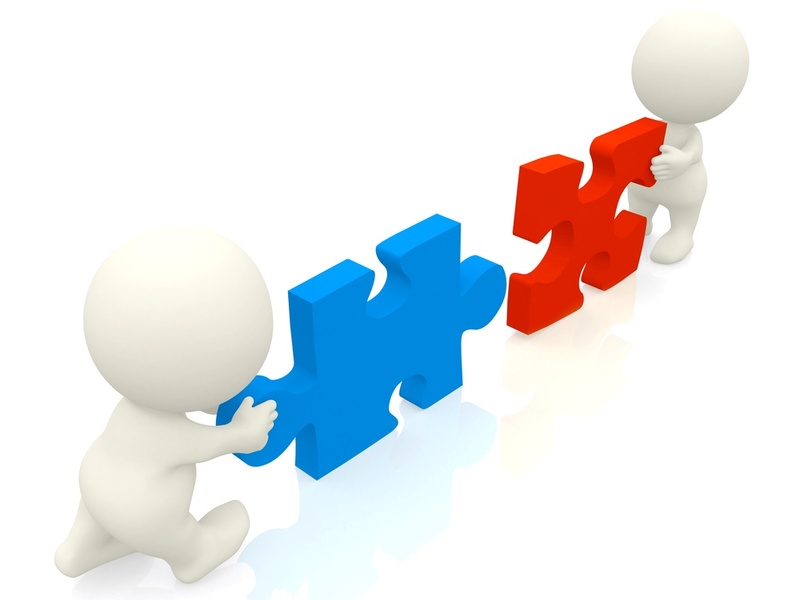 By working through the sales and marketing alignment process, this will highlight how much marketing budget and investment is required to support your sales team and targets, and ultimately company revenue goals. What period of time do you need to generate a return from marketing to sales? We typically measure and report on a quarterly or monthly basis from a starting position of your annual target or financial year target. Working through this process will either identify an alignment or misalignment between sales and marketing, in either, or both directions. As an example, we worked with an IT industry client through this process, where we found there was at least a 50% gap in marketing investment to support their annual sales target of $1M – the BDM didn’t have the marketing support or budget needed to hit their sales target for the year. This alignment process is helpful to demonstrate to executive management when planning out your sales and marketing strategies with goal setting. Working with, and to, the sales and marketing ROI required for writing the business case internally will help identify and justify whether to allocate towards either sales headcount or marketing activities.